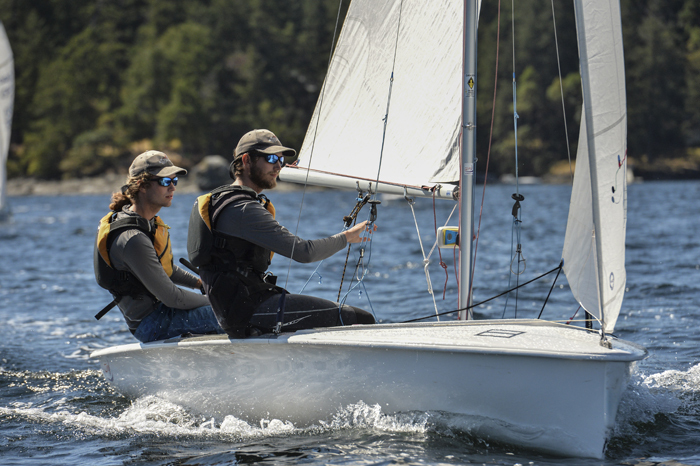 From left, brothers Cianan and Callum McGuffin sail their 420 class dinghy to third place at the B.C. Summer Games in Maple Bay this weekend. Salt Spring athletes and coaches who participated in the 2018 BC Summer Games over the weekend were rewarded for their efforts. Over 2,300 athletes aged 11 to 18 from around the province competed at venues in the Cowichan Valley from July 20-22. Salt Spring sent baseball player Matty Schure, sailors Callum and Cianan McGuffin, and swimmer Debbie McNaughton. Jacky Cooper took head coaching duties in equestrian sports and Jane James was an equestrian official. “It was really fun and really well organized,” McNaughton reported of her first BC Games experience. McNaughton earned a silver medal and beat her personal best time in the Special Olympics 50-m backstroke event. She earned fourth-place finishes and beat her best times in her two other races. McNaughton will be headed to Antigonish, N.S. to compete in Special Olympics national competitions this weekend. Hanging out with the other athletes and meeting some of the people who will be going to nationals was a highlight of the weekend for McNaughton, who has been swimming competitively for four years. McNaughton’s teammate Dawn Hadler will also be going to Nova Scotia for the national event. Cooper has participated at many BC Summer Games in the past and this time was responsible for Zone 7, coaching three girls from Terrace. “It’s giving back to your sport, and I love working with kids,” Cooper said. Her team included the youngest rider in her division, an 11-year-old who completed two dressage tests and a musical free-style. Of the two 15-year-olds on the team, one received two gold medals and one silver, while the other rider received a personal high score. The McGuffins earned a bronze medal in the Boys/Girls 420 sailing event with Callum as skipper and twin brother Cianan as crew. Callum said one of the things he enjoyed about the BC Summer Games was meeting all the athletes from other sports — something they don’t usually get to do at sailing regattas. The venue at Maple Bay was also good, and had ideal weather with sunny skies and winds of 10 knots. The team is fairly happy with their bronze medal, although McGuffin believes they probably could have advanced one or two places if they had put more attention on the rest of the fleet and less on the race course itself. “We’re also just seeing that as a really good experience, just seeing how much mindset affects performance,” he said. “It can do 20 knots downwind, so it’s pretty fun,” McGuffin said. For more on this story, see the July 25, 2018 issue of the Gulf Islands Driftwood newspaper, or subscribe online.